SeaWorld Orlando’s original roller coaster, Kraken, is getting an extreme upgrade today with the grand opening of Kraken Unleashed – a virtual reality coaster experience. Kraken Unleashed is the first-of-its-kind in the country, and has fully integrated VR headsets in the ride vehicle. The experience immerses you on a journey into the ocean on an exploratory mission, but guests will run into trouble along the way. Each dive, turn and inversion guests take on the coaster is reflected in the VR experience, which results in an exciting adventure complete with an encounter with the Kraken. Each of Kraken’s passenger trains now have the virtual reality experience capabilities, allowing guests to choose to enjoy the VR coaster or ride without it. 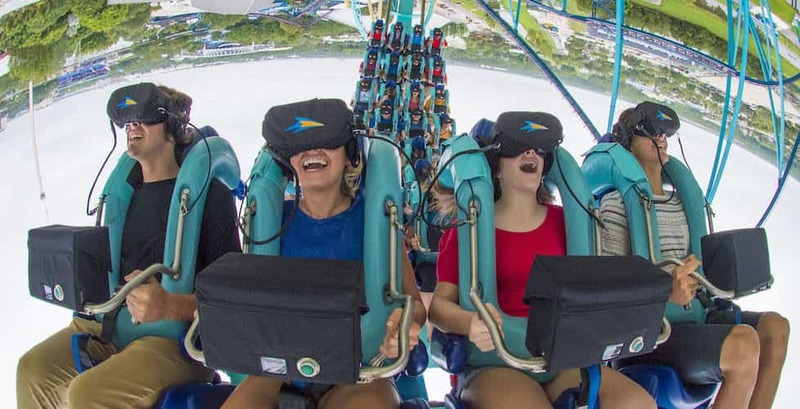 The custom designed VR headsets are electronically and mechanically fused with the coaster seat, and the seats are programmed to give each guest a cohesive and unique virtual reality experience. The opening of Kraken Unleashed kicks off SeaWorld Orlando’s summer season, and park guests will be able to find new experiences to enjoy all over the park. New experiences are being created and opened in addition to the park’s animal encounters and entertainment. With Kraken Unleashed being just the beginning for SeaWorld’s summer, the upcoming Electric Ocean kicks off on Saturday, June 17. This evening experience allows guests to enjoy the lights and sounds of an electronic dance music (EDM) festival, complete with bioluminescent sea creatures, dancers and DJ entertainment. Shows like “Pop,” and fan favorites “Shamu’s Celebration: Light up the Night” and “Sea Lions Tonite” will provide more evening entertainment, all culminating in a nightly fireworks display.